You’re in for a treat as we dive into the world of Bhang and review the infamous Bhang Bar. After all, as marijuana becomes further decriminalized, edibles are growing in popularity as an alternative to smoking. Nowadays, the divide between regular and medicated artisanal edibles is so slim as to be negligible—the cannabis, of course, makes all the difference. Some prospective edible buyers are only looking for an alternative to smoking. Others are looking for something fun, like medicated gummy bears, soda, or vegan recipes and treats they can try. Others, meanwhile, want something that tastes great and works as advertised. Bhang makes edibles for this third group of people. Making great-tasting chocolate is one of Bhang’s top priorities. The cannabis is almost an added bonus. Is the Bhang Bar for Me? Scott J. 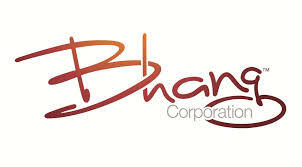 Van Rixel, the CEO of Bhang, is a certified Chef de Cuisine and Master Chocolatier, whose regular gourmet chocolate company, Chocolate Cartel, still operates today. Co-founded with his brother, Tim, in New Mexico, Chocolate Cartel’s assortment of truffles and chocolate bars quickly veers into the unconventional. They sell, for example, blueberry port truffles alongside 90% dark chocolate Bhang bars. It’s this creativity on which Bhang was founded and operates. According to their official website, Van Rixel, alongside his team of chocolatiers, has made producing world class chocolate their first and foremost priority. With Van Rixel’s pedigree, it’s hard to doubt this bold claim. As a company, Bhang sells both edibles and vape products. Their flagship product is the Bhang Bar, which comes in many flavors—ten are shown on their website, however, due to the structure of the Bhang company, availability of specialty flavors will depend on your local dispensary. The company itself is essentially a wholesale retailer. Independent manufacturers operate in some of the different states in which marijuana is legal, including California, Colorado, Michigan and New Mexico. Once the products are manufactured, they’re distributed to a huge range of legal cannabis dispensaries, so that medical patients in legal (or medically legal) states can enjoy them with ease. Vape products sold by Bhang include a vape pen and pre-filled cartridge called the Bhang stick, a premium pre-filled cartridge called Bhang Black Private Reserve, an All Natural Bhang Stick Cartridge, Pure Cannabis Oil Bhang Stick Cartridges, and a disposable all-in-one vape pen called the Bhang Perfecto. Alongside their chocolate bars, the company also produces mouth sprays, available in THC and CBD-predominate versions, as well as a CBD and hemp oil-infused chewing gum, designed as a pain relief and wellness supplement. No matter which Bhang product you’re considering, it’s comforting to know Bhang backs it up with a “Triple Promise Guarantee.” Found on the company’s website, the guarantee makes three claims (hence the name). First, Bhang promises to deliver the highest quality in medical cannabis products crafted from the finest in raw organic botanicals and ingredients. Second, Bhang promises to provide transparency with precise and consistent amounts of cannabinoids in every one of its products (we’ll discuss this one shortly). And finally, Bhang promises the utmost care in safety and handling of its products, and practices standards of the highest degree in production, testing, and packaging. 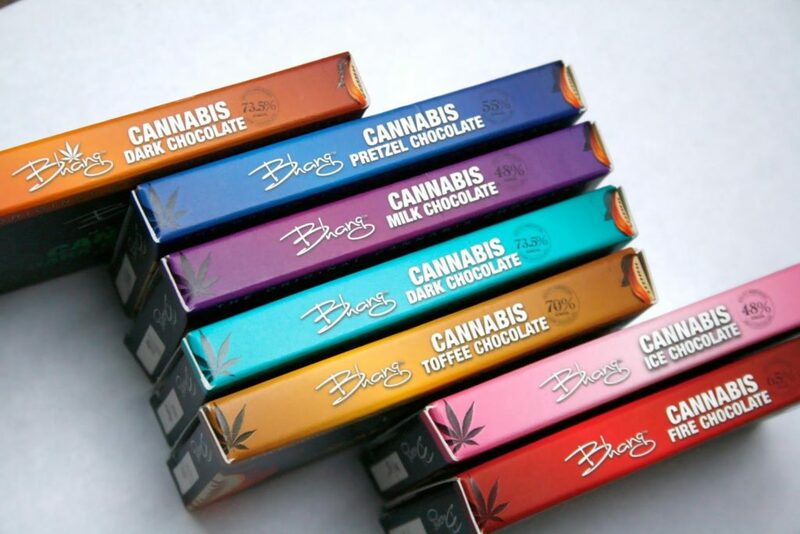 Some of the flavors the Bhang Bar comes in (no exhaustive list is available on their official website) include dark chocolate, milk chocolate, cookies & cream, ice chocolate (peppermint), pretzel, toffee, cherry, CBD caramel and fire chocolate. Each of these has its own characteristic flavor. The ice chocolate, for example, is cool and refreshing, whereas the fire chocolate has a noticeable spiciness, and even leaves behind a kick after the bar has been consumed. The cannabis component is noticeable, however, so be aware there will be a hint of cannabutter accompanying any of these flavors. The bars come in single, double and triple strength variants, which corresponds to 60, 120 and 180 milligrams of THC. Each bar is divided into four individual doses, so standard doses for each of these bars will be 15, 30 or 45mg, respectively. Depending on the flavor, strains used for the medicated portion of the bars are advertised as being predominantly hybrid (sativa-dominant), indica or in the case of the caramel flavor, 50/50 between CBD-dominant and THC-dominant strains. 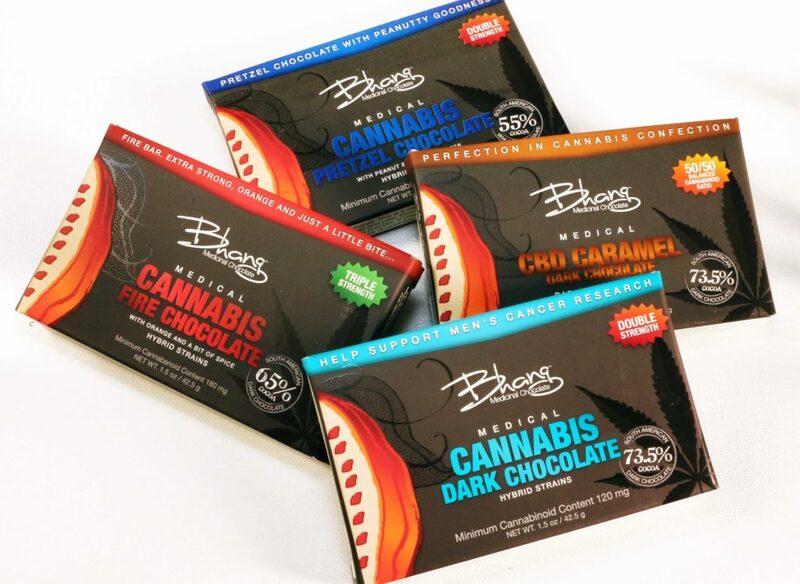 This wide range of choices means that connoisseurs of artisanal chocolate (or marijuana edibles) may find something new to try in Bhang’s range of products. Furthermore, CBD strains are seldom utilized in edible products, so anyone who prefers the effects of CBD should keep an eye out for the caramel flavor at their local dispensary. The bars work, too. For the average cannabis patient, one 30mg dose of the double strength bar should be plenty to attain a noticeable high. Most users report effects kicking in after just 15-30 minutes, and describe first effects as cerebral, providing a mild head-high followed by full-body relief and relaxation. Many patients report intense pain relief from a Bhang Bar, which makes it perfect for those suffering from arthritis, joint pain, back pain, or any other type of chronic pain. The duration of the effects certainly seems to vary, with some users reporting only 2-3 hours of pain relief while others report a surprising 6-8 hours. We recommend trying one for yourself (and starting with a low dose) to determine where your tolerance lies with Bhang. Most Bhang Bar’s retail in California cannabis dispensaries for anywhere from $15-30, depending on the dosage. If you’re looking for an easy way to find if dispensaries in your area carry Bhang products, look no more, as Nugg’s powerful search feature does the scouring, which lets you do the devouring. So you can rest assured you’re going to get what that plenty of expert cannabis users have had positive experiences with Bhang’s products. In my experience, one 30mg dose of the milk chocolate bar is plenty sufficient, but some users online report having to consume an entire double strength bar to feel any of its intended effects. While Bhang’s website mentions lab testing being a part of their production process, no further information is available on just how their products are tested. Though their products invariably work, and function as advertised most of the time, there’s a level of variance large enough to be attributable to more than just the tolerance of individual users. Communication issues extend beyond variances in strength as well. The packaging itself very visibly advertises the strength as per their single/double/triple classification, as well as the percentage of cocoa used in each given flavor’s production. What’s lost in this packaging (in my opinion) is a more explicit display of the actual amount of THC in milligrams each product contains. While it IS included on the packaging, it’s in a much smaller font at the very bottom, that may be hard to spot when deciding whether or not to purchase the product at your local dispensary. Since cannabis education is scarce, this could easily lead to doses larger than may be desirable. A “triple-strength” chocolate bar sounds appealing, but you won’t think so after becoming couch-locked and having your brain-melt (don’t worry, this won’t actually happen). In general, we believe it’s imperative for companies who produce cannabis edibles, vaporizers, flowers, concentrates, etc. to make explicitly clear to consumers what a proper dose is (in milligrams of cannabinoids), how long that dose should require to take effect, and what testing process was conducted before that product hit dispensary shelves. So, as with any edible product, be careful, and know how to control your cannabis dosages. As evidenced above, people like Bhang bars. However, they don’t go to the lengths some other companies (Kiva Confections or Mary’s Medicinals are great examples) take to assure that their users are getting the dose they desire or need. 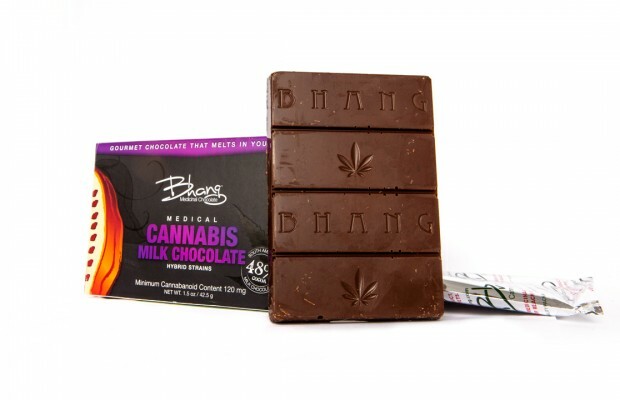 First-time users of the Bhang bar should go in expecting a chocolate bar that tastes great first, as per Bhang’s priorities, and will leave you with as strong a medicated high as you desire. Bhang bars are inarguably fun. The range of flavors and high quality South American chocolate were an early influence on the now thriving artisanal edible scene. As per this Bhang bar review, they’re ultimately recommended for anyone whose idea of a good time doesn’t hinge on a consistent high, but rather a compelling and high quality product. As always, it’s best for you to decide for yourself, since Bhang’s products are currently on the shelves of your favorite dispensary. Or you can simply visit Getnugg.com, the GrubHub of medical marijuana delivery services, and have Bhang products at your door in about an hour. Nugg delivery is now available in over 60 California cities, and provides online research and thousands of products from local cannabis dispensaries, with 24/7 customer service and no cost to you. Register now for free home delivery. Dear bhang bar Corporation I love my bhang bars what happened to the quality of my cookies and cream they look white! you’re bhang bars which I love they don’t melt anymore they used to look green cookies and cream used to be extremely tasty now it doesn’t even MELT!!! what are you doing to my bang bars!?!? I have pictures if you want to see I am a patient and suffer from degenerative disc disease spinal stenosis left sciatic neuropathy L3 L4 L5 and S1 herniated bulging disc Hardware in my neck fibromyalgia and more please fix my bhang bars so I can continue to purchase them thank you blessings to each and everyone. I just love bhang bars! If you want to be energetic and alert, with a yummy sugary and milky taste plus cocoa, then go for bhang bars! Great post about Bhang bars! I like to try these chocolate bars too! Great post!